Colonies on potato dextrose agar at 25°C grow rapidly, reaching 4.5 – 5.5 cm in 1 week. Colonies are initially white, becoming buff and powdery to granular at maturity. Reverse is honey-colored to brownish. Hyphae are septate and hyaline. Conidiophores terminate in groups of 2 to 4 annellophores in a scopula (broomlike structure, similar to a penicillus in the genus Penicillium) . Annellated zones on the annellides measure approximate 2.5 — 3.5 µm wide. Annelloconidia are globose to ovoid, measure 5-9 x 5-7 µm, have a distinctly truncate base, and are finely to coarsely roughened at maturity. The teleomorph is Microascus brevicaulis. Ascomata are black, spherical, and ostiolate with short necks measuring 80-150 x 70-130 µm. Ascospores are kidney-shaped, 5-6 x 3.5-4.5 µm, smooth, and reddish-brown in mass [de Hoog, Guarro et al. 2000], . 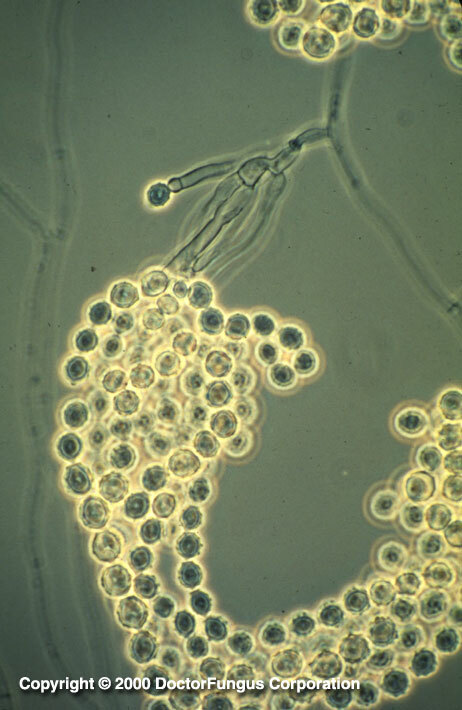 Scopulariopsis brevicaulis is an agent of onychomycosis , , , and of opportunistic disease in immunocompromised patients , . It has also been reported as the etiologic agent in a plantar infection , and in granulomatous skin disease . Invasive manifestations include two cases of endocarditis associated with prosthetic valves , , fungal keratitis , , and posttraumatic fungal endophthalmitis .